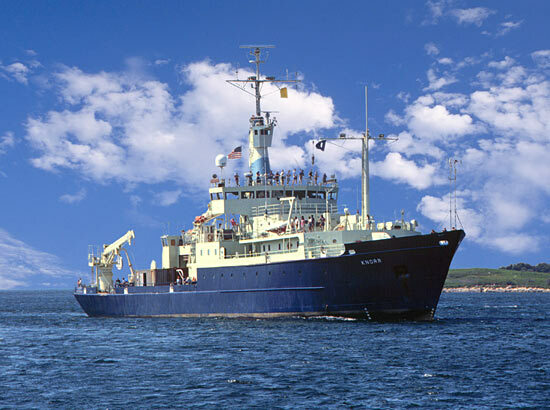 The research vessel Knorr is owned by the U.S. Navy and operated by the Woods Hole Oceanographic Institution (WHOI) for the ocean research community. Knorr is best known as the ship that supported a team of WHOI and French researchers in 1985 as they discovered the wreck of the RMS Titanic. Launched in 1968, delivered to Woods Hole in 1970, and completely overhauled in 1991, R/V Knorr has traveled more than a million miles—the equivalent of two round trips to the Moon or forty trips around the Earth. The ship’s anti-roll tanks and ice-strengthened bow enable it to work in all of the world’s oceans and to the edges of the Polar Regions. The ship can carry a crew of 22 and a scientific party of 32 to sea for as long as 60 days. Knorr was designed to accommodate a wide range of oceanographic tasks, with two instrument hangars and eight scientific work areas; a fully equipped machine shop; three oceanographic winches; and two cranes. Knorr is equipped with sophisticated navigation and satellite communication systems, as well as unique propulsion systems that allow the ship to move in any direction and to maintain a fixed position in high winds and rough seas. In 2006, the ship was refitted to support a new “long-coring” system that can extract 46-meter (150-foot) plugs of ancient sediment from the seafloor. Weighing nearly 11 metric tons (25,000 pounds), the new piston-coring system is the longest in the U.S. research fleet (twice as long as existing systems). Knorr and its long-corer will allow scientists to sample deep sediments that are rich with historical information about the oceans and climate. R/V Knorr was named in honor of Ernest R. Knorr, a distinguished hydrographic engineer and cartographer who was appointed Chief Engineer Cartographer of the U.S. Navy Hydrographic office in 1860. Knorr was one of the leaders of the Navy’s first systematic charting and surveying effort from 1860 to 1885. Reprinted with permission from Woods Hole Oceanographic Institution.